In accordance with what is now an established tradition, Gooding & Co. will be the last of the three major auction houses kicking off their year in Arizona. Gooding & Co.’s first sale of 2019 will get under way on Friday January 18th at 11 a.m., and resume, at the same time, on Saturday 19th. The auction venue is in North Scottsdale Road in Scottsdale (AZ), at the corner with East Highland Avenue. The lots can be viewed from Wednesday 16th through Saturday 19th, from 9 a.m. to 6 p.m. each day, except for the Saturday, when viewing will end an hour earlier. The buyer’s premium will be 12% of the final bid price for transactions of $250,000 and below; in the case of final hammer prices above $250,000, 12% will be applied to the first $250,000 and 10% on the amount exceeding this threshold. This arrangement represents a strong increase compared with last year, when a flat rate of 10% was applied. The catalog includes 160 lots: 158 cars and two motorcycles, with 64 vehicles offered without a reserve price. Ferrari will be the brand most represented at the auction, with 30 cars, followed by Porsche, with 24. Fourteen of the 158 cars included in the catalog were built after 2000. The oldest car offered (without reserve) is a 1902 Yale Rear-Entrance Tonneau (chassis #1002) that took part in the London-to-Brighton Veteran Car Run in 1978 and in 1996, while the most recent is a single-owner 2018 Ferrari GTC4 Lusso 70th Anniversary Collection (chassis #ZFF82WNA4J0232718), which has done 750 miles from new. The lowest estimate has been assigned to a 1951 MG TD (chassis #TD 8672) that has had only two owners in the last 40 years; it is being offered without reserve with an estimate of USD 25–35 K. The sale’s highest estimate (USD 6–8 million) has been assigned to two cars: a 1964 Ferrari 275 GTB Prototype (chassis #06003) and a late-production 1963 Ferrari 250 GT SWB Berlinetta (chassis #4037 GT), the fourth-to-last SWB built and one of the only 96 “Lusso” versions of the SWB produced. Eleven cars have been assigned lower estimated values of more than one million dollars, with two expected to fetch at least USD 6 million and another two USD 5 million, while one car has been estimated to be worth at least USD 2 million, and six have lower estimates of USD 1 million. If the four cars with the highest estimates, all Ferraris, are sold at their lowest estimate, they alone will generate a turnover of USD 23.25 million. Back in the 1960s, all cars, even “supercars”, had a far harder life than they do today. Whereas today’s prototypes, once they have undergone all the development work at the factory, can expect to immediately enter a collection, and thereafter remain barely driven, back then, even in the case of a 12-cylinder Berlinetta, they would have been further developed for rally use. This is exactly what happened to this particular prototype (chassis number #06003), the very first 275 GTB built, created as a unique prototype to develop the new series. Equipped with the 3.3-liter Tipo 213 engine, the 275 GTB came into being with a very difficult mission, that of replacing, in the hearts of customers and also on the world’s racetracks, the much loved 250 SWB. Pininfarina designed the body, which was then produced by Scaglietti in Modena, while the Maranello engineers worked on setting the new engine. Built in 1964, #06003 was finished in Giallo Prototipo (Prototype Yellow) over black, although at some later stage it was repainted in Rosso Cordoba (Cordoba Red). During its time at the factory, this 275 was often used as a model for sales pictures, while its parts were used by FIA to check the correspondence with the technical sheet. It was upgraded to newer solutions on a daily basis, evolving, for example, from the early “short nose” configuration to the later “long nose” one. On April 30th, 1965, the Italian DMV released its certificate of originality, mandatory in order to register a car for normal public road use, after which it was sold first to SEFAC (Società Esercizio Fabbriche Automobili e Corse) on May 7th and then, immediately afterwards, to its first private owner, a certain Pasquale Ramera di Coccaglio of Brescia. He returned it a few months later, and in the November of the same year, the 275 found itself back in Maranello, at the factory’s customer care center for a service, prior to being registered in Modena (MO 129151) and prepared for its next adventure, the Monte Carlo Rally held the following January. Its participation in this event was certainly an unusual choice for a Ferrari, and the reasons for it are not known, but it seems that both Ferrari racing manager Eugenio Dragoni and managing director Ugo Gobbato were both interested in seeing the car’s numerous futuristic new elements, like the transaxle and the De-Dion rear suspension, pushed to their limits in grueling competition conditions. The team taking part comprised rally driver Giorgio Pianta (a former member of the Lancia HF Squadra Corse) and Ferrari test driver Roberto Lippi. Before competing, however, #06003 had to spend some time in Ferrari’s experimental department headed by Mike Parkes. During this phase — the car needed to be put through test drives amounting to around 12,000 kilometers before the start of the competition —, it received several modifications, including a different hood, a third wiper, a 75% limited slip differential, reinforced glass, radiator blinds and external driving lights. Tire tests followed, and both Dunlop and Finnish Rengas Alas tires were tested. Formally entered by the Milanese Scuderia Sant’Ambroeus, the 275 was accompanied by two breakdown vans, provided by the customer care service, one driven by Lorenzo Bandini and the other by Giampiero Biscaldi. Driveline issues forced the car to retire close to Nyons, but not before it had made a lasting impression on the onlookers, and also on its driver Giorgio Pianta, who, in 1991, still described driving it as “the most beautiful memory of my life”. After the rally, the 275 was returned several times to the Maranello customer care center before finally being returned to Coccaglio, this time registered to a certain Loredana Pozzi. Two months later, it was sold again, in Tuscany, where it was registered in the name of Marco Olmi. Thereafter, after passing through the hands of several Italian owners, first in Tuscany and then in Sicily, in 1973 the car was sold to a Neil Emson of New Zealand, who registered it to his Italian address in Milan. In 1977 the 275 was exported to the USA, specifically to Colorado, where it entered the ownership of Henry Fuchs. In 1989, the 275 returned to Europe (Sweden), before crossing the Atlantic once again, in 1991. After a further American owner, in 1994 the car entered its current ownership. 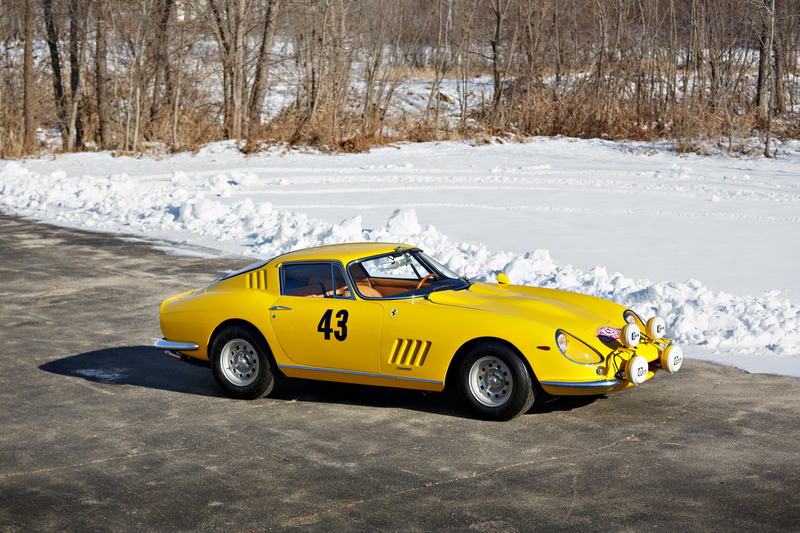 Still very original, and only sporting Ferrari installed parts, this car, practically unseen in the last 25 years, is now offered for sale with an estimated value of USD 6–8 million. Hot rods are very unusual in Europe. Indeed in many ways they are far removed from the culture of all countries except for America. On the other hand, there can be no doubt that the hot rod movement helped to inspire generations of American enthusiasts, and these cars certainly make wonderful collectible items. The “dry lake” Roadster being offered at the Gooding & Co. sale is one of the most interesting hot rods, having being built, by Chuck Spurgin and Bob Giovanine, with the aim of racing, at speed, on the beds of salt lakes. Based on a 1925 Chevrolet Roadster and featuring a “pimped” Chevy four engine, with a Ford “C” crank, Curtiss OX 5 connecting rods and an Oldmobile three port head to increase the compression, this particular 1948 Spurgin-Giovanine Roadster emerged as the real star of the Dry Lakes competition organized by the SCTA (Southern California Timing Association) in 1948. 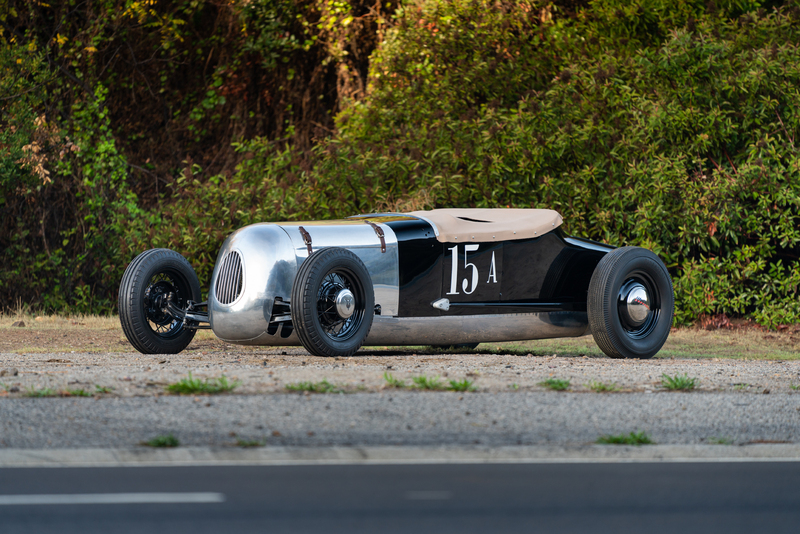 Thereafter, it continued to break records and also set that year’s final speed record (123 mph) in the roadster class A, a record that remained unbroken for the following two years. In March 1949 Hot Rod Magazine choose this car for its cover, an accolade that can be considered a sort of Oscar for a car of this kind. Five years later, in 1954, Chuck Spurgin sold the car to the aerospace engineer Carl Borgh, who called it “Mothersill’s Special” and replaced its engine with a GMC one that took the car up a level in terms of speed and allowed her reach 141 mph. Finally, the car was totally re-engineered in 1955 and reached 149 mph at the Bonneville races of the same year, before being sold and going on to compete with its new owner, Robert Cano, in 1956 and 1957. After that it disappeared and for a long time was considered lost, until, 40 years later, the original frame and body resurfaced behind a garage in Apple Valley (CA). Its current owner purchased it, still as a project, in 2004, and then spent five years restoring it, before it was shown at Pebble Beach and inducted in the Dry Lakes Racing Hall of Fame. 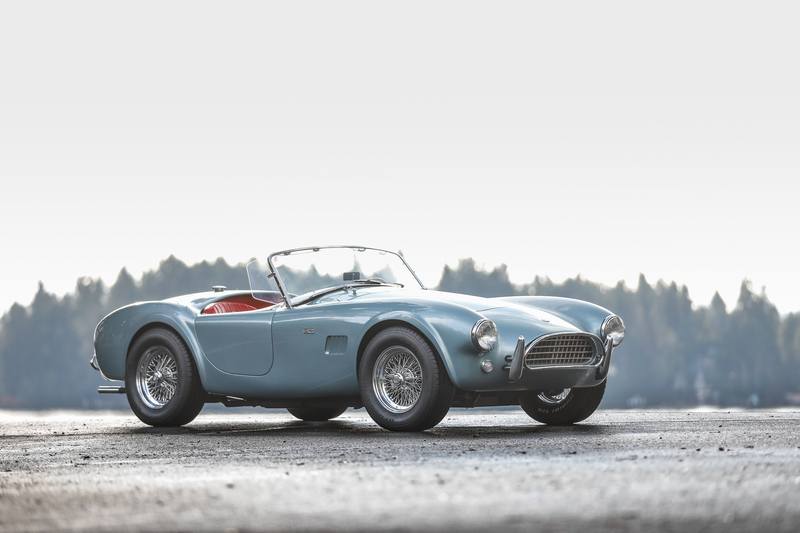 It is offered for sale with an estimate of USD 250−350 K.
The Cobra, the most impressive and renowned American racing car of the 1960s, originated from an idea of Carroll Shelby, namely to equip a compact car, like an English two-seater AC model, with a big capacity American V8 engine, and then use it for racing. The 427 c.i. “big block” is the most revered engine, but the most balanced and usable version is undoubtedly the original, and purer, 289 one. On December 11th, 1963, this Cobra (chassis #CSX2246) was sent by AC from England to Shelby’s new workshop, at Los Angeles International Airport, to be transformed from a pre-assembled, uncompleted AC into a perfect 289. Consistent with its early production date, #CSX2246 was equipped with rack and pinion steering, Ford electronics and American-made Stewart Warner instruments. Finished in Princess Blue over red, a fairly common but nevertheless beautiful combination for a Cobra, it was then equipped with aluminum rocket covers, a chrome air cleaner, bumper guards, adjustable wind wings, tinted sun visors and heater, and white sidewall tires. Sent to Coventry Motors of Walnut Creek, CA, on February 27th, 1964, it was offered for sale at a total price of USD 5,195, a considerable sum of money at the time. It was bought by a certain Edward Hyland of San Francisco, where it was registered with black and yellow plates (registration number MCJ 442). In the first three years of its life, it covered about 32,000 miles. When, in 1973, Hyland moved to Los Angeles, he retired the Cobra from the road and kept it in storage, where it remained until his death in 1988. His widow then sold the unrestored car to Ken Comstock, a firefighter living in Los Angeles, who embarked on the project of restoring it in the garage of his home. In 1991, the finished car was shown at Palm Spring Vintage Race Concours and, in 1993 Comstock sold it. It had several further owners until 1999, when it entered its current collection. The present owner decided to fit the car with a more powerful, right spec engine he had been given by the previous owner of the Cobra, although he naturally kept the original, which still accompanies it. He enjoyed it in this configuration for a while before deciding to entrust it to Shelby expert Dave Wagner to be carefully restored in every last detail. It has covered 50 miles since the end of that restoration, and is now offered for sale with an estimate of USD 0.95–1.1 million. Amphibious cars, the embodiment of man’s dream of being able to drive cars on water as well as land, have long been in existence, but rarely enjoyed much success. Their main drawback tends to be that they perform like a car on water and a boat on tarmac! Despite this, German Hans Trippel, the man who sold his patent for the gullwing door to Mercedes-Benz, launched his Amphicar in 1960, and by 1965 the 770 model had become (and most likely still is) the most successful civil amphibious vehicle ever built, with almost 4,000 units manufactured. It was aimed at the American market, and indeed around 3,000 were shipped there in total. With the passing of the years, the few survivors have achieved good collectible status. The example offered by Gooding and Co. (chassis #100481) belonged to a young American lady driver, who received it as a gift — an unusual choice for a first car — from her father. She used it for a few years, until the day her father spotted her surfing in it in the wake of a container ship on Lake Michigan and took it away, replacing it with something more “grounded”. It was only in 1986 that, following her father’s death, the first owner discovered the car still on the family premises, simply tucked away behind a stack of boxes. 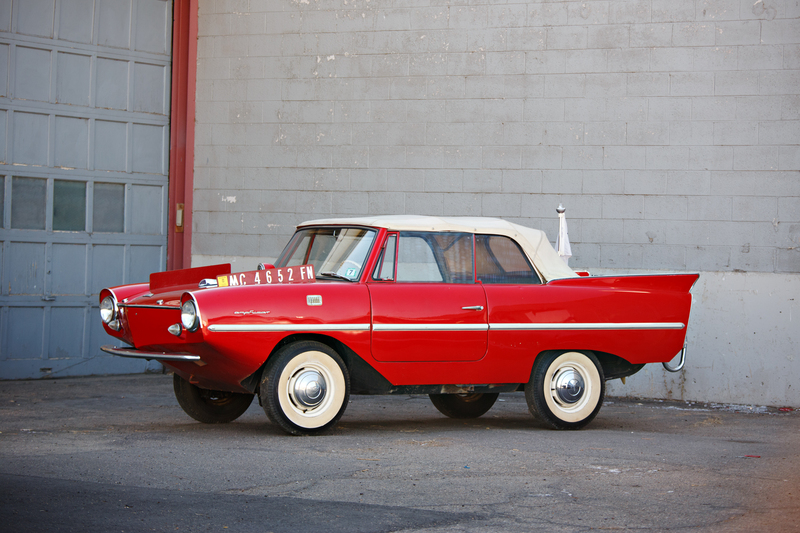 She kept it until 2005, when it was sold to one of America’s most renowned Amphicar experts, the former president of the American Amphicar Club. He kept it as found, complete with its original paint, interior and tires (these old tires make it better as a boat than a car!). With only 4,500 miles covered from new, and two very careful owners, this Amphicar is, most likely, the most original specimen remaining, and it is offered, without reserve, with an estimated value of USD 60–80 K.
The Speedster, a true Porsche icon, is today revered as one of the most amazing cars built by the company in its early years, and perhaps ever. 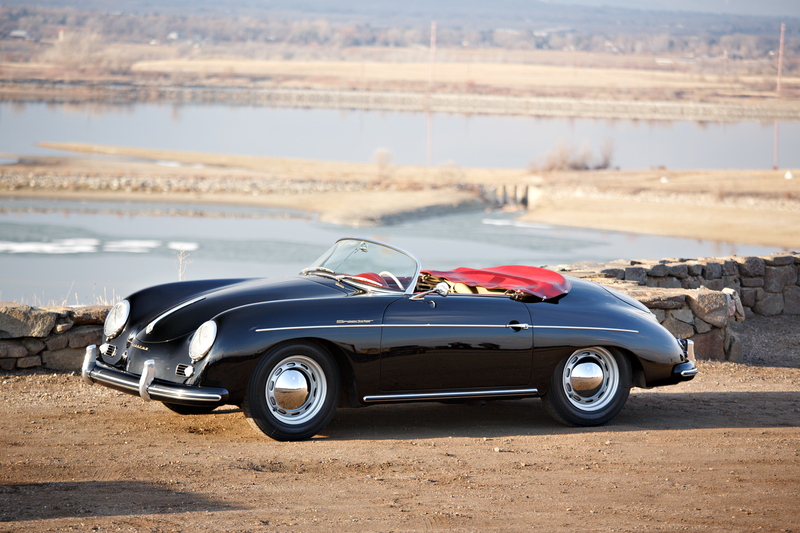 Originally aimed at a clientele on America’s sunny West Coast, the 356 A Speedster was a simplified version of the model, designed to appeal to a less wealthy customer. As often happens, the marketing plan went awry, with the result that 356 Speedsters are now actually among the most expensive Porsches. Speedsters are cars that tend to go through a multitude of owners and end up pretty abused, often requiring complete restoration, starting from the few original pieces left. Well preserved ones are instead quite rare. This 1956 356 A version (chassis #82117, with matching engine number, 61060) being offered for sale at the Gooding & Co. auction has a very unusual and charming history, having benefitted from a single owner for much of its life (from 1968 to today). A sale document accompanying the car shows that it was bought by a Melvyn Shapiro of Boulder, CO, for USD 1,295 on June 11th, 1968. The purchase was apparently inspired by a trip Shapiro had made to Europe. When he purchased the car, it showed signs of hail damage to its Acquamarine paint, as well as some rear collision damage, and so he took it to Porsche expert Tom Conway, known to use lead to finish bodies before spraying, instead of the usual filler. Thereafter, Shaprio and Conway remained in contact, and over the past half century, the maintenance of this Porsche has always been done by the same person. During this time, the Speedster was used and repainted by the owner himself in black, before, in the early 2000s, being put through a complete and professional restoration in order to get it into shape for the Speedster 50th anniversary celebrations at the 2004 The Quail meeting. Today the car, coming from a 51-year ownership and with many awards and trophies under its belt, is offered for sale with an estimate of USD 450–550 K.
Maserati chose the 1956 Geneva Car Show to unveil a new granturismo equipped with a detuned, six-cylinder, 3.5-liter racing engine. An open version soon followed and, after considering two other bodyshops (Carrozzeria Touring and Carrozzeria Frua), the company finally selected Carrozzeria Vignale to build, in a limited series, the new 3500 GT Spider. Two prototypes were built, both on a shortened (−2500 mm) chassis, and shown on the Maserati stand at the November 1959 Turin Auto Show. The car offered here is one of them. Reputedly the first of the three prototypes built, chassis #101.505 (with matching numbers engine) is one of the most renowned prototypes of this model, of which only 242 units were built in total. Officially completed in January 1960, it was mounted with body number 2, finished in Grigio (gray) paint and trimmed with red leather. In the early 1960s, it was sold as new to a Franky Watts of Miami, who kept it until 1965, before selling it to the first of a very long list of owners all over the USA. In 1982 the car was shipped back to Italy to be restored by Carrozzeria Campana in Modena. Noticed by an Italian enthusiast, it was purchased on the spot and remained in Europe for the following 10 years, after which it was sold first to an American collector and then, in 2002, to its current owner. 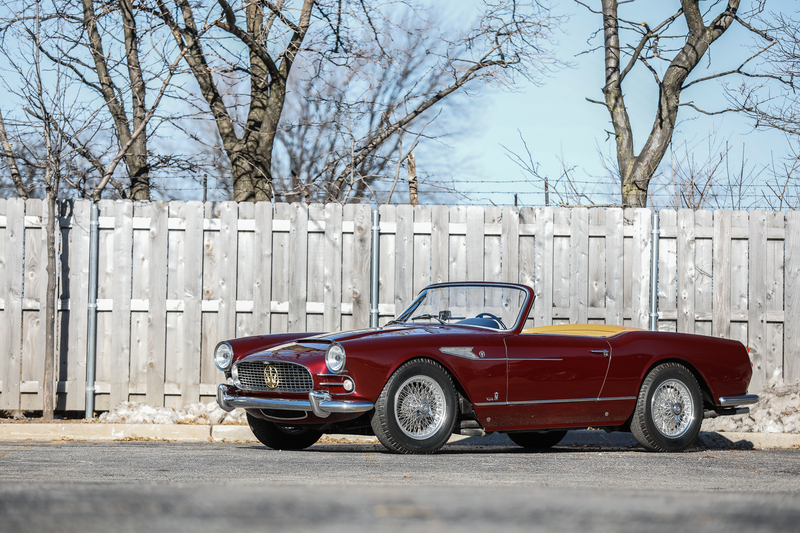 This well-kept Ruby Red 3500 Spider Vignale prototype, still showing the evidence of the work done in Modena, has been kept in storage for the last 20 years or so, and acquired a wonderful patina. It is offered for sale with an estimated value of USD 1−1.2 million.